The cauldron of the Anatolian hills and plains have had a new spice added not in a pinch but a spoonful with the tide of the turcoman tribes brought along by the Seljuk's conquest. A disputed region between Christendom and Dar Al-Islam, at the height of the Seljuk's dominion many a sultan chose to 'encourage' their brethren who remained loyal to a wholly nomadic ancestry to settle in the frontier regions of their rule to diminish the threat they'd offer to their sovereignty./n/nConsisting of professional ghulams recently freed along with men of high status in tribal turkish society, these aristocrats can provide a decent worth on the battlefield for a master of any faith or nation. Their dress is relatively simple, being the turkish coat with the addition of lamellar hauberk and the metal-skullcap lined tribal turkish hat. 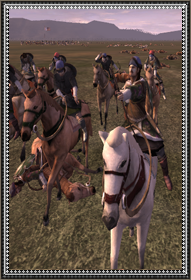 Beholden to the mobile methods which brought them victory over the slower Romans and Ghaznavids, these nobles are best used as better armored skirmishing horsemen emphasizing the bow rather than horsemen who may wield bows, but are meant for the charge.